Yukon Cabs are bolt together cabs with OEM styling. Cab is not ROPS certified, but fits over the existing, un-modified factory ROPS. 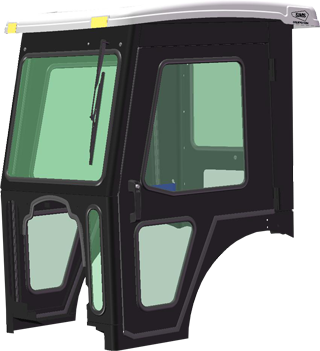 Included in this cab are features such as a powered front wiper on a safety glass windshield, and rear safety glass panel. This cab is available with a choice of either soft or hard doors, and a color-matched ABS formed roof. Your cab can be custom configured below with these and other optional accessories. Cab height is 61 inches, measured from the platform floor.